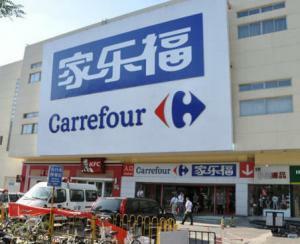 Carrefour Pay Launches in China with UnionPay, but Can the Network Beat Back Rivals Alipay and Tencent? | NFC Times – Near Field Communication and all contactless technology. China UnionPay is fighting what has been a losing battle for mobile payments market share against Ant Financial-owned Alipay and Tencent's WeChat Pay. The network's latest initiative is a QR code-based payments service with Carrefour, a major retailer in China. NFC TIMES Exclusive Insight – Carrefour and China UnionPay have launched their 2-D bar code-based Carrefour Pay wallet feature, as UnionPay continues to try to find relevance in a booming Chinese mobile payments market now dominated by Alipay and WeChat Pay. The announcement late last week of Carrefour Pay, which includes loyalty and offers, appears to have gained little attention, even in China, however. The vast majority of transactions in China’s massive mobile payments market are handled by Ant Financial, the Alibaba affiliate that runs Alipay, and Tencent Holdings, owner of WeChat Pay. Analysts have estimated the size of China’s mobile payments market at US$3.5 trillion as of the end of June, reportedly up by more than 20% quarter-on-quarter, though some analysts place the size of the market as high as $6 trillion. Article has about 640 words.